This is one of the better drug cartel movies with a playing both sides angle to it that involves lots of carefree energy and a fun-wielding, break the rules attitude. A fun movie about drug smuggling and working for the cartels, this one tells a story we are pretty familiar with in a whole other way. Unlike being a dealer or even a ground level smuggler, like we’ve seen so many times before, (movies like Blow and the Infiltrator, the TV show Narcos,) this movie is about a pilot who works for the CIA and then gets mixed up with the drug trade, playing both sides at the same time. Barry Seal (Tom Cruise,) starts out just flying overhead countries in Central and South America, taking photos of what he flies over. Soon he’s bringing back drugs for the cartels. After that, he’s bringing in guns for the CIA. And at all times, this guy is pushing the envelope, seeing how much he can get away with, and brining in more and more money. This is the movie of a crazy rebel. He’s a fun antihero, and the movie gives us his very interesting and unique story. American Made is the War Dogs of drug cartel movies. If that film was about the rule breaking and big business of selling guns, and getting ahead while being careless and ridiculously gutsy, then this one is pretty much the same thing, for the drug industry. Like War Dogs, (The Jonah Hill, Miles Teller movie by Todd Phillips,) the characters are absolute rebels, in over their heads, and not looking back. Unlike that movie though, there is not a level of betrayal between the main characters. This time it’s one guy on his own, and if there’s anyone who can pull that off and the sell a movie, based on a one man story, it’s Tom Cruise. 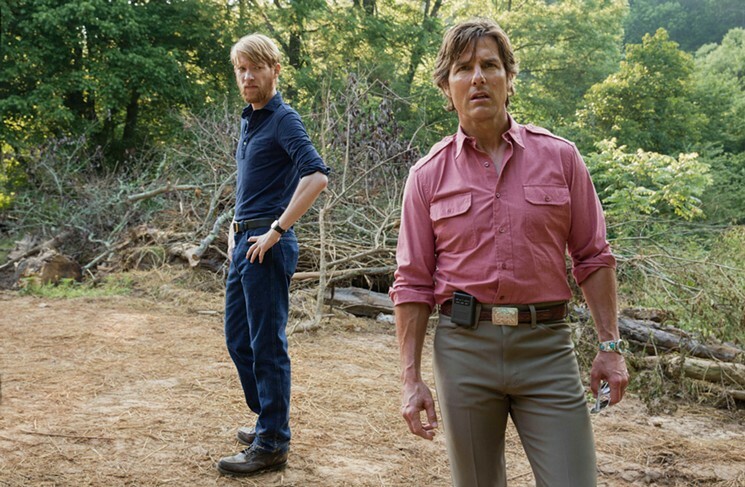 It’s not that Tom Cruise is the greatest actor in the world, but that he really has an everyman kind of feel to him and knows how to portray that. He knows how to get you to relate to his character, and how to bring the audience in. Ever since Jerry Maguire, Cruise has really shown a. mastery of that style. Sometimes the movie is bigger than him, and there’s nothing he can do about it, (like The Mummy,) but most of the time, Cruise can deliver. Just look at Edge of Tomorrow and how fascinating that movie was, with Cruise taking us along for a Groudhog Day-like ride through through battlefields of the future. Look at Vanilla Sky or Jack Reacher, (just don’t look at the sequel.) 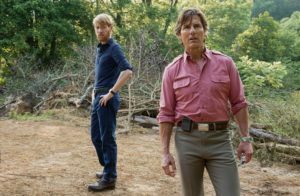 So with American Made, a movie about a man who plays both sides (both the CIA and the drug cartels,) Cruise is the right man for the job,. 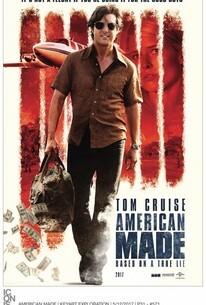 Here, he’s playing Barry Seal, a pilot who is looking for something more. We see Cruise saying goodbye to passengers as they exit his plane on multiple flights in multiple cities and countries, and realize how tiresome and routine the job must be. It’s clearly boring for an adventure seeker like this guy, and so when a CIA agent named Shafer (Domnal Gleeson,) comes to see him and offer him a job, Seal quickly accepts. The job is to fly small planes over Central America with cameras snapping photographs underneath it. It’s a spy plane, and Seal not only does it, but does an amazing job. The CIA loves his work, only they’re not offering him any raises, and Seal isn’t exactly thrilled about that. This leads him to accept another job when it comes his way. The Medellion drug cartel finds out what Seal is doing and brings him in. They have a job for him, and once again Seal accepts. This job involves flying drugs into America. The cartel loads up Seal’s plane with as many packages of cocaine as they can. Only Seal’s smart enough to know that if this is going to work, it needs to be done carefully. He empties his plane of most of the drugs, and takes only the amount that he is comfortable flying. Then he hides it in compartments on the floor of the plane. He also gets rid of the overweight man that the cartel expects to ride in the plane along with him and watch over their inventory. Even with making all of those changes, the flight still nearly doesn’t make the takeoff, and comes close to smacking straight into a bunch of trees. The runway is too small and the cartel refuses to make it an longer, dispute a number of pilots having tried and crashed before him. So now Seal is flying drugs into America and taking pictures when he goes back to Central America. It’s not enough. When Shaffer finds out that Seal is bringing the drugs in, he doesn’t get mad. Instead he asks Shaffer to takes on something else. Knowing that this guy doesn’t have the most clear morals, and that he is willing to risk death and do just about anything for more money, Shaffer tells Seal that if he’s going to keep flying the drugs in, he needs to start flying guns out. Suddenly Seal is playing both sides, and working for both of them at the same time, making a lot of money. All of this would be great, except for the people that American is bringing the guns to, (the contras,) don’t actually want the guns. Instead, they want drugs. That and to come to America. So Seal starts bringing the guns to the cartel and the drugs to the Contras. At this point, he’s crossing a line too far. It’s one thing to omit other jobs he’s doing from the CIA, but to take their money and guns and not even deliver them to where they’re supposed to go, is definitely asking for trouble. And it definitely catches up with this guy. First, it’s the local police in the town where Seal lives with his family kicking the door down and raiding the place. Only Seal isn’t around to see that. Shaffer tips him off and sets up a home for him and his family in Mena, Arkansas, and Seal gets his family out of the house just in time, heading off to Mean to set up in a new location. Not long after that we meet the brother of Seal’s wife. There’s always a long lost brother who shows up halfway into the movie and screws everything up. I recently saw Ingrid Goes West, a great movie that was extremely unusual and dark as hell, and yet it still had the brother cliche, showing up and wrecking everything. Here, JB, played by Caleb Landry Jones (the actor who has just had a huge year from Get Out to Three Billboards Outside of Ebbing Missouri,) comes in, sees all the money his brother in law is making, and starts stealing a bunch of it. All this despite the fact that Seal has given him a job and brought him into the operation. When JB gets picked up by the cops, it is the beginning of the downfall for everyone. Seal tries to get JB out of the country, only the cartel has other ideas, and thinks JB might start talking in order to make a plea deal. And it isn’t long before a whole bunch of other agencies find out about Seal, the CIA has to disavow that they ever knew him, and Seal is caught by four different agencies all at the same time. That scene, where everyone shows up at once, is a little too unbelievable. Especially in a movie that is supposed to be realistic. When True Romance and Enemy of the State tried it for their endings (both movies directed by Tony Scott,) it worked a little better because those movies were clearly made-up, but here it just feels forced. So does the way that Seal gets out of it to make a deal with the White House. Sure the fact that he goes all the way up to the top in order to get out of trouble is great, but the confidence that he has, knowing that he will get out of it, when talking to the different authority figures who have arrested him, is ridiculous. Especially when Seal had no idea that the White House thing was about to happen. And yet he’s sitting there telling all those guys that he’s about to walk free, while they’re all laughing at him. He even offers to buy them all Cadillacs if they let him go, knowing full well that they won’t. He’s just way too confident for a man who has no idea that the White House deal is coming his way. And that leads us into a new mission, working for the highest authority in our country, who as it happens cares the least about Seal of anyone. The ending makes a lot of sense, in terms of where it goes and how thing unfold. It might not be uplifting, but it’s certainly realistic. In a movie that took lots of liberties, it’s nice that they came back to reality for the final touches. Most of the movie is good, but there are some definite parts in the second half that feel forced. Still, when it comes to drug cartel movies, this is one of the better ones. It’s no Sicario, but it’s a hell of a lot better than the Infiltrator, and might even give Blow a run for its money. Being in that kind of company is a nice accomplishment.